On her maiden voyage, Captain Uhura and her newly assembled crew encounter two unique passengers which are either insane or carrying information vital to the security of the Federation...or both! 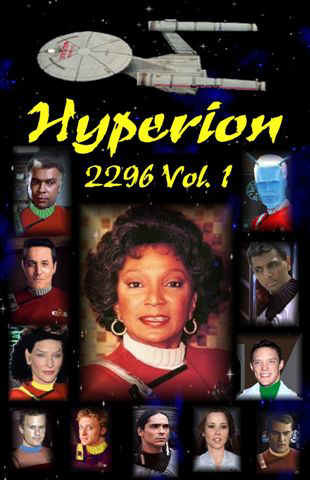 The crew of the Hyperion agrees to participate in a war game scenario for some Starfleet Academy cadets. Unfortunately, the games turn to tragedy when a Klingon crew reactivates one of the remote-controlled ships and opens fire on the defenseless cadet fleet! Can the crew of the Hyperion stop the slaughter? On an icy world, the Orions have discovered the only remaining survivor of a scientific experiment gone horribly wrong. To save his life, they have built a robotic survival mechanism and placed him in it. Unfortunately, he has no memory of what happened or who he was, and it's up to the Hyperion's medical staff to help his resolve the mystery! Hyperion has been sent to a planet to help a Federation ambassador rescue a Federation negotiator from certain death under their barbaric penal system. Unfortunately, the negotiator falls ill, and Uhura's science officer volunteers to take his place! The crew of the Hyperion is dispatched on what is ostensibly a secret mission to a plague-ridden world. Unfortunately, things are not what they seem as they discover the real nature of their mission, a mission which has drawn the attention of a Klingon battle group! Cover Artwork by Randy Landers. Featurs interior schematics and information on the Hyperion, and information on its command crew. 164 pages, 8½" x 11" size, coil binding. Price: $14.50, US Priority Mail. $20.50, International Priority Mail.